I first learned about the International Ocean Discovery Program during an undergraduate oceanography course and later used IODP data as part of my master’s research. I had always wanted to sail but my focused shifted my focus from research to science communication so I thought it was an unlikely possibility. That changed when I heard about a call for Education and Outreach Officer applications. I was offered a position aboard the JOIDES Resolution for Expedition 360 in the southwest Indian Ocean. At the time I did not fully understand what I had signed up for but this was the start of a pretty incredible adventure which continues to affect the trajectory of my career to this day. How do you prepare for two months at sea? I had absolutely no idea but I started by asking for a leave from work, and luckily my employer was incredibly supportive. After medical exams and figuring out what to pack I felt completely unprepared for the journey I was about to embark on. This is quite standard for those on their first expedition; I’ve never met anyone who felt fully ready to go to sea for the first time. Nevertheless, I boarded a flight to Colombo, Sri Lanka to meet the ship. It is a very odd feeling to walk around the boat which will be your home for the next 60 days. In a way the JR felt huge and yet claustrophobic at the same time; it was easy to get lost but realizing that the option of walking back down the gangplank would soon be gone was incredibly anxiety-inducing. Honestly, as the ship was preparing to depart, a big part of me wanted to grab a taxi straight back to the airport. Once we set sail, it was a matter of leaning the ropes; figuring out how to live life in very close quarters with 120 other people, in one of the most remote places on Earth. Everything was new: when can I eat? How do I do laundry? How do I stay out of people’s way? Once I settled into the routine of ship life, I focused on how to best do my job. Education and outreach officers have three main roles: giving webcast tours of the ship, maintaining the website and social media, and working on your own personal projects (I produced a podcast documenting the expedition). On Expedition 360 a new role emerged, media relations. 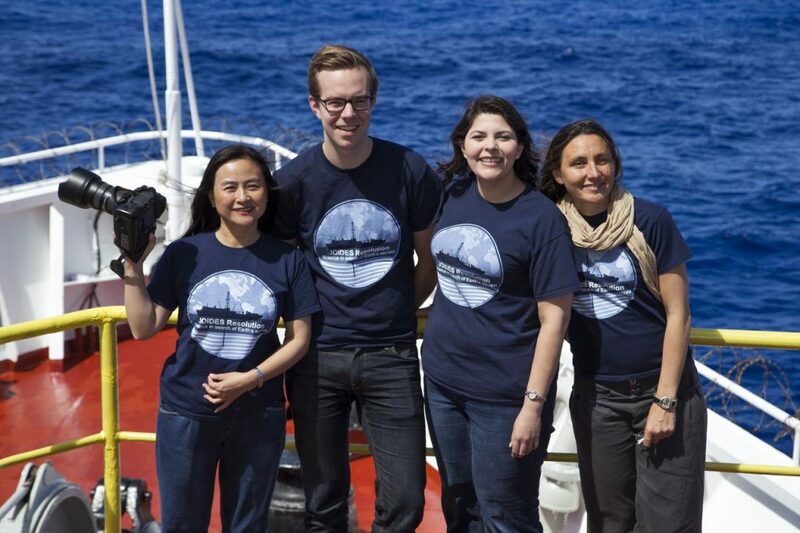 There was much global interest in the goal of starting a hole that could one day be the first to reach the mantle so we were regularly connecting reporters onshore with scientists onboard. Everyone fell into a routine and before long I was very comfortable with life at sea. There were ups and downs of course, on some days it felt like we were at sea forever and others felt like the time was flying by. The biggest challenge was staying in touch with those on shore; communication is limited to phone and satellite internet, which has one speed: painfully slow. This is particularly challenging if you need to keep up to date with work or projects back home. When I began planning my projects to complete onboard the ship, I was incredibly ambitious, particularly because I was planning for 12 hours a day of work, every day for two months. However, as the sixth week of the expedition rolled around I realized this was not nearly as much time as I had anticipated. The truth is you get busy on the ship and all three education and outreach officers on my expedition completed less than they had planned to. The end of the expedition was bittersweet, seeing the first sight of land in 60 days was incredible and everyone could not wait to get off the ship and eat some fresh produce! However, it was tough to say goodbye to the ship that had been our home for the past two months. I was excited to jump back into all the projects that had put on hold but the truth is being at sea for two months created such a back-log of things to deal with that it took me nearly two months to recover. My best advice to those sailing in the future would be to make it clear to collaborators that you have very limited access to communication during your time away and to book a few weeks of time after your return just to catch up on what you missed. My time on the JR directly resulted in the opportunity to attend two conferences, the National Science Teacher’s Association and the American Geophysical Union as well as an invitation to play a similar role on another expedition a year later. There’s no doubt about it, going to sea for that length of time is incredibly difficult. However, it has done some great things for my career and the truth is I still miss it sometimes. Lucas Kavanagh is a science communicator based in Vancouver, Canada and the co-founder of Avocado Video.